The IQP or Interactive Qualifying Project is a requirement for all Worcester Polytechnic Institute students. This requirement must be fulfilled in order to graduate. We are all student researchers, all in our Junior year at WPI and were selected to participate in the Worcester Community Project Center. A requirement to participate in the off-campus IQP in Worcester is a preparatory course taken the term prior to the project term (so in the case, prep-course C term and project is D term). During this prep course, known as ID2050, our group created a proposal complete with background research on the issue as well as our projected methodology we plan to use during the project term. This was then submitted to our sponsors who will help guide us through the upcoming term! This project has a few different sponsors that will help guide our project throughout the upcoming term. First off, our overall sponsor is Professors Corey Dehner and Dominic Golding. As our overall sponsors they will be guiding us while we are in our Project Center in downtown Worcester and will help with communicating with contacts located at the WPI Campus. Our second sponsor, is the B-Term IQP group made up of juniors at WPI. Those students are Liz Audet, Maris Pepo, Mike Cross, Ximena Auger. They will be helping us work on our events that we have planned because they have done it all before. They have been extremely helpful this far, and we can’t wait to work with them in the future! Our overall goal is to reduce the number of water bottles sold on campus and to increase the amount of water refilling stations. We would like to accomplish this through tap water challenges (where we offer different samples of tap and bottled water and see if participants can tell the difference) and through other various events on campus. We would also like to inform the community about the differences in bottled and tap water and the misleading marketing strategies that certain bottling companies use. Overall, we would like to change the attitude on campus to a more tap-friendly one to increase our sustainability for the future. 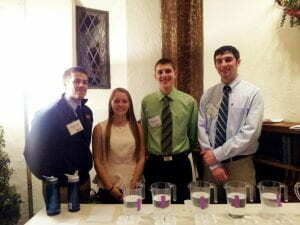 Our D-Term Think Outside the Bottle group is made up of four Juniors from WPI. Our four members come from a wide variety of backgrounds. Frank Ascioti is a Mechanical Engineering major and Naval ROTC student; Nick Rallis is an Aerospace Engineering major and a brother of Phi Kappa Theta Fraternity; Mark McCabe is a Mechanical Engineering major and a brother of Phi Sigma Kappa Fraternity; and Britney Atwater is a Biomedical Engineering/Pre-Med major and a sister of Phi Sigma Sigma Sorority. Each of our members have worked on research projects that have given us the skills needed to excel in this project endeavor. These previous experiences range from engineering design to neurosurgery research and publications.